TONIGHT is our next Muster! Don't forget to bring your flyer mount, and prepare for a little game! We'll meet at the Mage Tower and move to our location from there. If you'd like to join, be there by 20:00! Our next Muster is next Tuesday, the 31st! Our "Event Team" are busy putting together something that I'm sure will please even those whom are hard to please. Ah, what am I saying, you can't please all of the people all of the time, right? But you'll never know unless you SHOW! We'll be meeting at 20:00, the location to be announced later. *looks at the "Event Team" busy at work* Well well well, looks as if the Muster Event is still under wraps! I wonder what it will be... to find out, meet on Tuesday, 31st, at 20:00 at the Pig and Whistle in the Old Town part of Stormwind. There, all will be revealed! It's the night you've been waiting for! MUSTER night! The "Event Team" have prepared a special game tonight that will require a vivid sense of imagination! Put on your thinking caps, and meet us at the Pig and Whistle at 20:00 for more details! Hello again fellow Azerothians! On Thursday the 16th, we'll be heading once more into Nagrand for a little game in the skies. If you'd like to join us, please be sure you have your flying license. If you were there last time, you'll know what is going on. If you weren't, prepare to have some fun! We'll meet at the Mage Tower in Stormwind at our usual time, 20:00. In two days, we'll be looking to the skies in Nagrand! As stated, please be certain to have your flying license as we WILL be up in the air and you WILL be required to be moving on your own. Thursday is the day, 20:00 is the time, the Mage Tower is the place to be till we get the ball rolling! Question, Ahvie. Can people without a high level (and obviously no flying licence) join if...let's say someone has a two-seater flying mount? Ooof...I am embarassed by how long it has been since I've checked back on here. In my defense, I've not been feeling well! But still...it's embarassing. 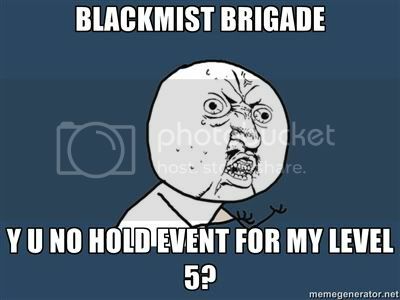 Why do we not do events where a level 5 can come? Well, we do sometimes, it is just a hit and miss thing. A few weeks ago we met at one of the Inns in Stormwind and had a round robin story telling. I just try to mix things up a bit, and unfortunately that means that low level alts can't always be a part of it. As for the flying license thing, it wouldn't work if you and your rider picked different answers to the question and had to move in different directions. You may have found a way around that, I don't know since I was not at the last one (again, illness took hold of me) but I'm just not sure how well it would actually work. But without further adieu, I present the information for our next Open Muster! This is it...the Muster you ALL have been waiting for! Alright, maybe not, but it got your attention, yes? This coming Friday, the 24th at 20:00 in the evening, Ahvie Tours Limited will be sponsoring the second half of the Stranglethorn Vale tour. We'll be starting at Booty Bay and working our way north to the Sundering. Meet us at the well outside the Gryphon Roost where we'll begin!